I have been working as a Lecturer at A.V.Parekh Technical Institute - Rajkot since 3rd November 2016. 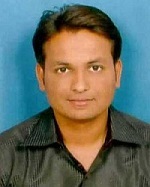 Worked as a Lecturer(Contractual) at Government Polytechnic, Rajkot from 10/10/2012 to 02/11/2016 in Mechanical Engineering Department. I have completed my B.E. in Mechanical with distinction (76.3%).